Network-focused research in public administration has expanded rapidly over the past two decades. This rapid growth has created come confusion about terminology and approaches to research in the ﬁeld. We organize the network literature in public administration using compact citation networks to identify coherent subdomains focused on (1) policy formation, (2) governance and (3) policy implementation. We trace how these domains differ in their approach to deﬁning the role of networks, relationships and actors and to what extent the articles apply formal network analysis techniques. Based on a subsequent content analysis of the sample articles, we identify promising research avenues focused on the wider adoption of methods derived from social network analysis and the conditions under which networks actually deliver improved results. 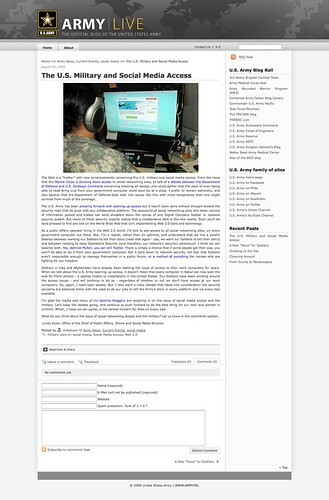 Please email me in case you want to read the article! Twitter—a microblogging service that allows for short updates of 140 characters—has grown to over 540 million registered accounts as of early 2012.News organizations, corporations, and the U.S. government have adopted this new practice as an innovative form of interaction with their stakeholders. 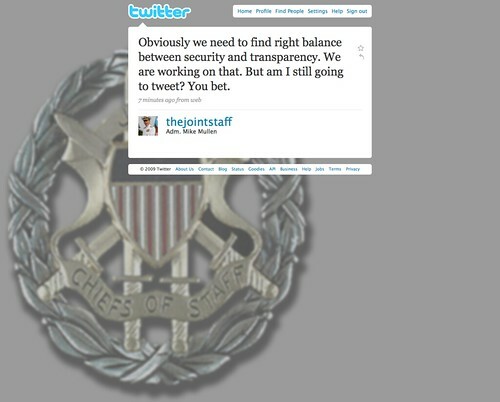 Many government agencies maintain at least one Twitter account, and even multiple accounts, based on their operational needs and their diverse audiences .It can be unclear to government Twitter users what the best strategies are for interacting with the public on Twitter, and how an agency can use Twitter in a meaningful way to support its organizational mission. Twitter updates are seen as public conversations and are increasing not only transparency and potentially accountability, but can also—when used appropriately—lead to increased inclu­sion of public opinion in policy formulation through information aggregation processes. Twitter can be used effectively to involve a large number of citizens and create conversations with an engaged, networked public. The outcome of these conversations can be new insights and even innovations in the public sector including suggestions on how to make government more effec­tive, or rapidly accelerating emergency responses that help to improve public safety. In addition, hands-on best practices are presented for both public managers and social media administrators. Twitter is still a relatively new tool. The platform frequently changes and features are added or moved, so government organizations need to be flexible and react to the changes. Suggestions on how to overcome both the technological and behavioral challenges are provided, and examples of best practices show how agencies have overcome these hurdles. It will be important for the future use of social media in the public sector to show how invest­ments in content curating and online interactions affect a government organization. Current measurement techniques are provided to help social media managers create a business case for the effective use of social media. At the 2010 International Sunbelt Social Networks Conference, to take place at Riva del Garda, Trento, Italy, from June 29 to July 4, 2010, we intend to organize a session on Twitter networks. 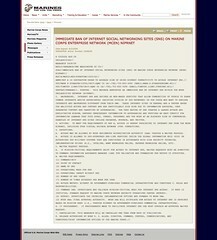 We are looking for papers with empirical evidence using the social networking and micro-blogging service Twitter.com. Twitter has become one of the most prominent publishing channels of short messages during the last year and caught our attention as network researchers. We would like to initiate a session on how network researchers use the public conversations observed on Twitter and how they capture, analyze and interpret Twitter networks. Potential contributors should also note that at the Sunbelt conferences series, final (written) papers are not requested to be submitted: just abstracts suffice. However, all submitted abstracts of the proposed papers will be reviewed by the INSNA organizers (and not by the session organizers), who may also decide on the format of the paper presentation (as lectures of 20 minutes or posters of 60 minutes). In any case, since we would like to coordinate the Twitter networks session, potential contributors in this session are free to contact us before the end of November 2009, as the deadline for submission of abstracts of contributed papers is December 1, 2009 now January 15, 2010. Nonetheless, the abstract submission should be done by the contributors themselves who should complete the Submission Form here. Since the name of the session “Twitter networks” is not listed in the Session field of this Form, applicants should insert it in the “New Session” field. On a personal note: Just designed the cover of a new publication. My dissertation (from 2005) will be available in a print-on-demand version soon. An increasing number of public institutions of higher education are realizing that there is a need to integrate innovative technologies into their curricula in order to enable students to access and review academic content anytime and to connect with each other outside of the classroom. Many public institutions of higher education have recognized this need and are in the process of introducing new practices in order to meet changing market conditions. These practices are generally referred to as eLearning practices. Besides the intended outcomes of digital student support and access to teaching content, applying eLearning practices and integrating them into the traditional existing teaching routines challenges an organization in multiple ways. The aim here is to show the factors influencing this adoption decision process. To gain a deeper understanding of the patterns and success factors of the adoption of eLearning practices, a social network perspective was applied to the process through which innovative technologies adopted by faculty members. Mergel, I. 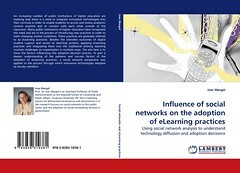 (2009): The influence of social networks on the adoption of eLearning practices: Using social network analysis to understand technology diffusion and adoption decision, Lambert Academic Publishing, Cologne, ISBN 978-3-8383-1083-1. Originally uploaded by Ines Mergel. Lowering the cost of government. I am especially curious how Kundra and his colleague Beth Noveck will accomplish point 4 and what kind of tools they will use to increase participatory democracy. I visited the Open Government Committee of New York State today and am very impressed with their accomplishments over the last 35 years.